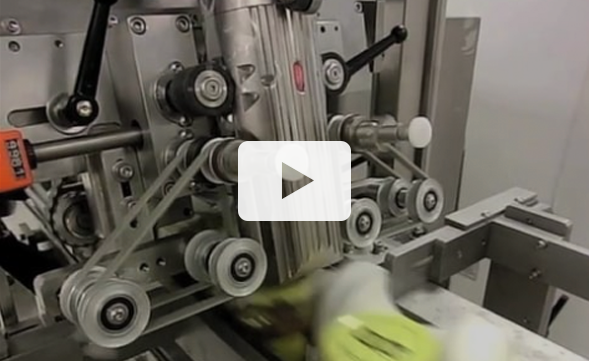 PDC’s R Series systems are some of the fastest tamper evident shrink banders in the industry. They are proven to apply PVC and PETG sleeves at up to 700 cpm; the R-1000 version has been tested at speeds over 1000 cpm, applying a 30 mm tall neckband with exceptional reliability. This patented, heavy-duty, single-headed, in-line tamper evident shrink bander is ideal for food and beverage applications. R Series systems are compatible with thin gauge banding materials (1.25 to 2 mils, or 30 to 50 micron). Engineered for continuous service, the system’s material web flow is never paused for cutting or application. Our exclusive “tool-less” changeover feature allows operators to switch from one product to the next, quickly and efficiently. R Series machines can also be used in special high speed banding and labeling applications, such as labeling small form-fill-seal pharmaceutical vials at 600 pm.